"You must live for something. And you must be willing to die for something." 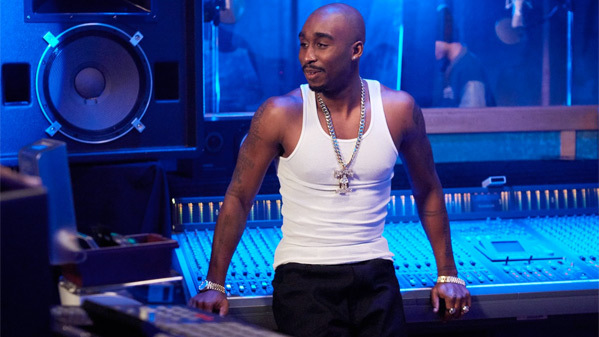 Open Road Films has debuted another new trailer for the Tupac film All Eyez on Me, which makes this the fourth trailer for the film since they started debuting last year (see the first, second, third here). The film profiles the life of extremely successful American rapper Tupac "2Pac" Shakur, who has killed in a drive by shooting at the age of 25 in 1996. Demetrius Shipp Jr. plays the late great musician, also starring Danai Gurira, Kat Graham, Annie Ilonzeh, Dominic L. Santana, Keith Robinson, plus Jamal Woolard as Biggie. This trailer actually gets more into his complete life story with some real scenes, and it still looks damn good. I'm so in. You can still watch the teaser trailer for All Eyez on Me here, or the second teaser or third trailer here. A chronicle of the life of rapper Tupac Shakur. Originally titled just Tupac, the film will focus on the career of Tupac all the way up to the fatal drive-by shooting in Las Vegas in 1996. The new title is a reference to Tupac's fourth studio album, released in February of 1996 months before he was killed. All Eyez on Me is directed by filmmaker Benny Boom, of the films Wild for the Night and Next Day Air previously, as well as many music videos. The screenplay is written by Ed Gonzalez and Jeremy Haft. Open Road Films will release Boom's All Eyez on Me in select theaters starting on June 16th, 2017 this summer. Still interested?